Jackson Pollock, No. 5, 1948, oil on fiberboard, 244 x 122 cm. (96 x 48 in. ), private collection. The term was coined by the American critic Harold Rosenberg in 1952, in his essay "The American Action Painters", and signaled a major shift in the aesthetic perspective of New York School painters and critics. According to Rosenberg the canvas was "an arena in which to act". 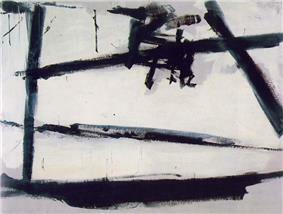 While abstract expressionists such as Jackson Pollock, Franz Kline and Willem de Kooning had long been outspoken in their view of a painting as an arena within which to come to terms with the act of creation, earlier critics sympathetic to their cause, like Clement Greenberg, focused on their works' "objectness." To Greenberg, it was the physicality of the paintings' clotted and oil-caked surfaces that was the key to understanding them. "Some of the labels that became attached to Abstract Expressionism, like "informel" and "Action Painting," definitely implied this; one was given to understand that what was involved was an utterly new kind of art that was no longer art in any accepted sense. This was, of course, absurd." – Clement Greenberg, "Post Painterly Abstraction". Rosenberg's critique shifted the emphasis from the object to the struggle itself, with the finished painting being only the physical manifestation, a kind of residue, of the actual work of art, which was in the act or process of the painting's creation. The newer research tends to put the exile-surrealist Wolfgang Paalen in the position of the artist and theoretician who used the term "action" at first in this sense and fostered the theory of the subjective struggle with it. In his theory of the viewer-dependent possibility space, in which the artist "acts" like in an ecstatic ritual, Paalen considers ideas of quantum mechanics, as well as idiosyncratic interpretations of the totemic vision and the spacial structure of native-indian painting from British Columbia. His long essay Totem Art(1943) had considerable influence on such artists as Martha Graham, Isamu Noguchi, Jackson Pollock, Mark Rothko and Barnett Newman; Paalen describes a highly artistic vision of totemic art as part of a ritual "action" with psychic links to generic memory and matrilinear ancestor-worship. It is essential for the understanding of action painting to place it in historical context. A product of the post-World War II artistic resurgence of expressionism in America and more specifically New York City, action painting developed in an era where quantum mechanics and psychoanalysis were beginning to flourish and were changing people's perception of the physical and psychological world; and civilization’s understanding of the world through heightened self-consciousness and awareness. The preceding art of Kandinsky and Mondrian had freed itself from the portrayal of objects and instead tried to evoke, address and delineate, through the aesthetic sense, emotions and feelings within the viewer. Action painting took this a step further, using both Jung and Freud’s ideas of the subconscious as its underlying foundations. The paintings of the Action painters were not meant to portray objects per se or even specific emotions. Instead they were meant to touch the observer deep in the subconscious mind, evoking a sense of the primeval and tapping the collective sense of an archetypal visual language. This was done by the artist painting "unconsciously," and spontaneously, creating a powerful arena of raw emotion and action, in the moment. Action painting was clearly influenced by the surrealist emphasis on automatism which (also) influenced by psychoanalysis claimed a more direct access to the subconscious mind. Important exponents of this concept of art making were the painters Joan Miró and André Masson. However the action painters took everything the surrealists had done a step further. ^ Rosenberg, Harold. "The American Action Painters". poetrymagazines.org.uk. Retrieved 20 August 2006.